Life, Laughter and Paris: What a Bargain! It's been almost a year since we moved and before switching homes, we did a gi-normous purge. We got rid of almost as much stuff as we kept. No more junk. No more unnecessary clutter taking up closet space (we hardly have any closets in the new place - which isn't new at all - it's old). You know what's coming don't you? Look what I bought! 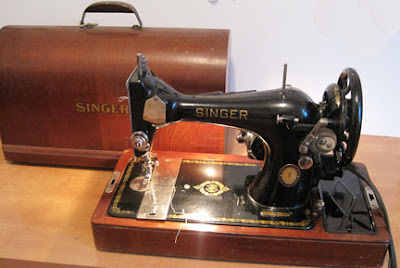 We went to an auction at a local church this weekend and there were NO bids on this old sewing machine. It's electric (in an antique sort of way), has all the extra bits and bobs including the case, and even the light works! All it needs is a good dusting and a bit of polish on the wood. There were two machines of this style, and the auctioneer wanted $5.00 for BOTH. Who could resist? I'd have to be mental to let this get away. I haven't even looked at the second one yet (which doesn't have a case), but WHATEVER! Just think of all the money I'll save sewing up little Chanel-like numbers. Maybe I"ll make curtains and things too. Or maybe, just maybe, I'll just keep the machine as a conversation piece. I'll let you know. Really, we all have to have some clutter. I mean.....I can't go the rest of my life not buying ANYTHING can I? And surely I could get my $5.00 back if we hold another garage sale. Now I'm keen. Bring on the flea markets, garage sales, bazaars and auctions. I have a pocket full of change and I'm looking to spend! Wow Susan that takes me back mum had one just like when I was a kid. I wonder was it a Ford thing any colour aslong as its black. Isn't it cool? Think of all the great stuff we'd have if our mothers hadn't dumped things. We'd make a fortune on eBay!